Ever wonder how they get Christmas trees to look perfect in magazines? In this 3-part series, we’ll give you some more technical information to help place, choose and decorate your Christmas tree so you can have a tree that is not only picture perfect, but also suits your home and style. PART 1 – Where should I put my Christmas Tree? Before investing in my Easy Treezy, my Christmas tree’s location was completely dictated by how to keep it safe from children and pets (anyone else have a dog who LOVES to drink tree water?). Now that I don’t have to worry about it tipping, breaking or getting assaulted by a thirsty canine, I can put my tree anywhere I choose. So, after probably too much research, I’ve narrowed it down to the following 5 points to consider when selecting the ideal Christmas tree location. Natural Light – While placing your Christmas tree next to a window can bring a bit of Christmas outside, it might not be the best thing for your home or your tree. First, you’re effectively blocking the flow of natural light to your home, which means you may be turning on more lights and increasing your electricity bill even more. Secondly, the light can either dry out a real tree or it can fade an artificial one. Flow – There is a natural flow to your home, even if it’s impeded in places. The last thing you want is to place your tree in a place that disrupts that flow. If you’re going to have to constantly walk around it, chances are you’ll end up damaging your tree before the season is through. Also, creating a disruption can also lead to negative feelings about your tree. Pro-Tip: There are a few occasions when you want your tree to break the flow. This is usually done with a large, stylized tree acting as a focal point. Always consider your habits when setting up a tree like this. 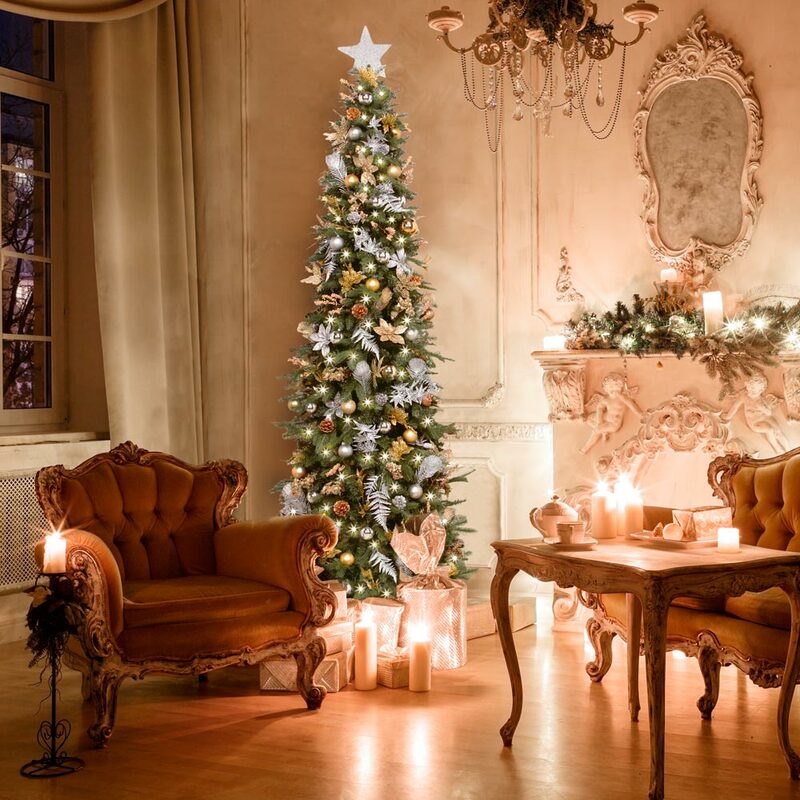 Celebration Location – If you’re celebrating the holidays in your home, think about how that usually works out. Does the place you’ve chosen have enough room for gift opening? Is the tree visible from the dinner table? Pro-Tip: Angle your furniture slightly towards your tree. It will help draw the eye to your tree. Logically – It’s easy to get carried away with the perfect location, but also consider the technical aspects of your tree. Is it close enough to an outlet for the lights? Can you water it (if needed)? Is it far enough from the fireplace to not be a fire hazard? If pets and kids are a concern, is it protected? Pro-Tip: For safety’s sake, absolutely keep your tree at least 8 feet from the fireplace guard. View – Is it Christmas in every room in your house (I might be guilty of sneaking a fresh tree branch into every windowsill in my house, but it smells so nice!). If so, try to place your tree in a location where it will be visible from multiple rooms. Seeing the tree from your kitchen while making cookies will certainly enhance the mood. Check back with us next week. In part two of setting up the perfect Christmas tree we’ll discuss picking a tree to fit the space you’ve chosen.